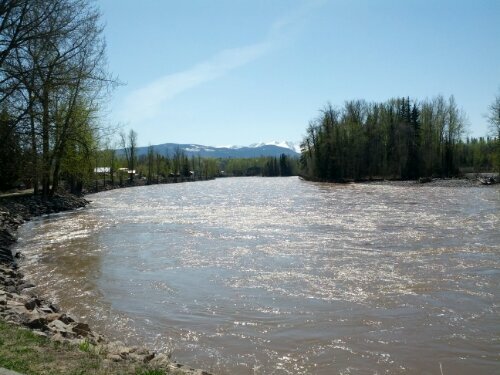 It was another warm and beautiful day leaving New Hazelton. The trees lining the highway (aspen?) are a vibrant green and snow-capped mountains dot the horizon. 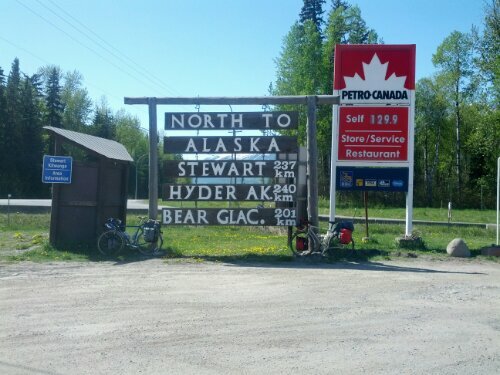 We make quick work of our final miles on highway 16 and soon reach the junction with 37, the Cassiar Highway, marked by a large quantity of slightly redundant road signs. We pull over for a photo op and have lunch at the lone gas station at the junction. The town of Kitwanga sits at the base of the highway and I stop to pick up some bear spray from the general store in town. We’ve been hearing horror stories of bears for the last few days and I want something to put my mind a bit at ease. Heading north into the wilderness and wind, the scenery does nothing but become more impressive. Mountains continue to line both sides of the road as it snakes through the valley, moving from ponds and reeds to dense pine forest and back again. As evening approaches we begin searching for a campsite for the night and soon find a pulloff on the side of the road that goes back far enough to offer some privacy from the highway. After setting camp and cooking some freeze-dried meals we put our food up in a tree for the night. I have a bit of trouble trying to apply my mountaineering knots to the situation but manage to keep the food aloft somehow. 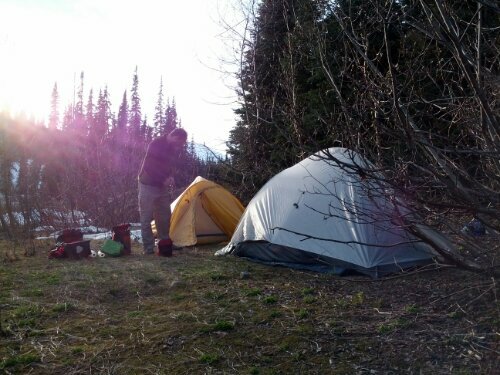 Though the sun has a couple hours left, the mosquitoes begin coming out in force and we retire to our tents. Reading my book, I count nine of the blood suckers on just one of my tent walls. Sleep comes and goes as I am awakened by rustling in the forest. A bear is trying to get our food, and its attempts go on for hours. Luckily we find in the morning that our food is still hanging from the tree. There is no civilization here. Rest stops with pit toilets and trash cans (called “litter barrels” here) are spaced about fifty miles apart, and the towns are much more infrequent. We fetch water from a stream in the morning and get on the road late. It’s hot again and we climb over hills, winding our way north. Soon larger mountains than we’ve been seeing appear on the horizon and the constant up and down turns into just up as evening approaches and we reach Meziadin Junction. The road here splits and heads off towards Stewart. One part of Alaska is only thirty miles away now but we have nearly a thousand miles to go before we reach our border crossing. 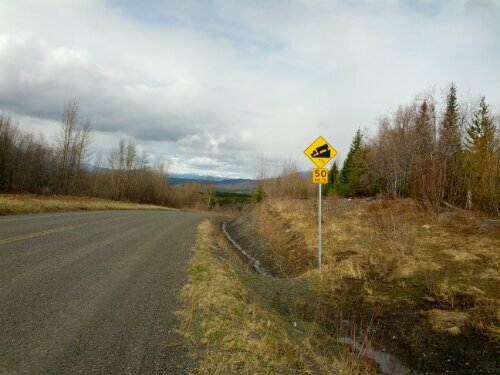 At the junction there are two separate pairs of hitch hikers trying to make their way north, and a black bear and her cubs is a hundred yards up the hill, right next to the road we need to take. We talk to the hitch hikers a bit while waiting out the bears and eventually head into the hills, bear spray in hand. Over the next three miles we run into two more black bears right on the side of the road, but waiting at a distance for passing cars to scare them off seems to be a good strategy. One truck driver is especially helpful, stopping his truck and repeatedly honking to scare off the bear. 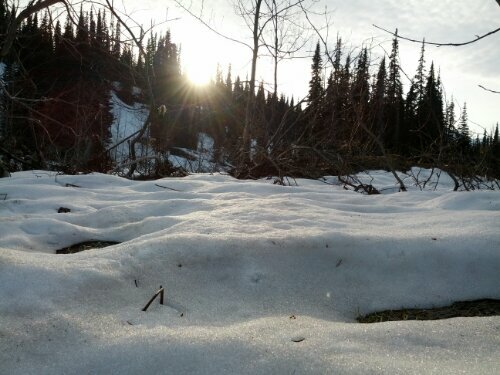 The hill keeps on rising and the sun dips briefly below the steep side of the mountain, causing the temperature to plummet. My legs feel fresh but Donald is flagging [ed. note: because he didn’t eat enough food] so we begin to hunt for a campsite. There’s another pullout a couple miles later; it doesn’t have much privacy from the road but we need to stop so we take it. Treeing the food is much easier this evening after I’ve had some time to think of the proper way to do it. 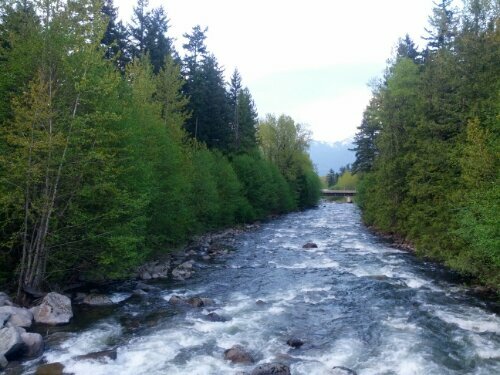 Perhaps the nearby river simply muffles the sound, but I don’t hear any bears trying to get at our food here. Rain and cold greets us the next morning. While fetching water the rain nearly stops, teasing us with the prospect of a decent day before returning to a downpour. After a bit of sitting in our tents in dread we set off once again into the hills, climbing higher through the miserable weather. There are feet of snow in the forests and meadows on either side of the road now and a mist comes and goes. 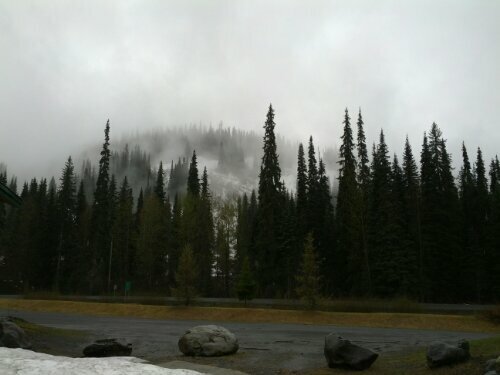 On my left pine trees dot a snowy lake, a light mist covering it all. I want to take a photo but between my reluctance to bring out my camera in the rain and the fact that my clumsy heavy gloves make operating it time consuming I settle for burning the memory into my head. A flock of small birds sits in trees on the side of the road, flying further down the road with us as if leading the way. These scenes are able to remove me from the cold briefly but soon reality returns. I am now experiencing the freeze-thaw cycles of the seasons every twenty minutes – as we race down hills large drops of rain pelt me as my legs and face freeze, only to once again feel warmth while climbing steadily up a steep hill. This continues on for a couple hours before a long descent brings us out of the mountains. The mist has lifted and snowy mountains are visible very close on either side as we follow a river towards the town of Bell II. Eventually we arrive to find the town consists of a lodge and only a lodge. The rates are exorbitant but the shower and bed are worth it. The next day is rainy and cold and we decide to take a rest day in Bell II. Back on the road Monday and we have to be out by ten, super early for us. The bridge in Bell II was damaged by a truck last summer and they are repairing it now. As such the bridge is closed for much of the day and we have to make a certain time window or be stuck waiting. We cross the bridge in front of the cars and soon it begins to rain. Climbing over multiple small mountain passes, the rain eventually relents. There are more snow covered mountains all around us, the peaks shrouded by clouds. We pass a black bear that just stares at us and get warned of an upcoming grizzly but never see it. The bear spray makes its way into my handlebar bag. Eventually some blue sky shows itself and a tailwind picks up. Cars are far and few between as they cannot pass the bridge at Bell II and the highway becomes a bike path. Over another pass, the road comes upon a wide valley. The mountains are getting smaller now, or less snowy at least and we begin making good time. Another few hours in the saddle lands us in the outskirts of Iskut. The weather has warmed up significantly. On the road into Prince George I was wearing my warmest gloves to keep from freezing but it was a balmy seventy degrees exiting town. 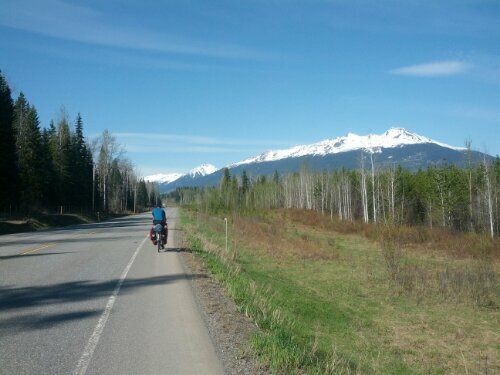 The first twenty miles went by quickly but a headwind picked up and slowed our progress towards the town of Vanderhoof. Towns are more prevalent out here than I initially thought and so we’re going to be hopping from town to town for the next few days. Sunday brought more subdued headwinds and progress was better as we continued west, stopping in the town of Burns Lake. The Chinese restaurant in town is closed Sundays but the pub has a surprisingly good menu. Another day on the road brings strong headwinds once more. A downed power line stops all traffic on the highway for over an hour and we decide to call it a night in the town of Houston. The Chinese restaurant here is closed on Mondays and we head to the pub in town instead. The menu is not as good as yesterday’s. Heading out from Houston the scenery is getting nicer. The rolling plains and pine trees are yielding to snow-capped mountains. We have a large climb and more magnificent views as the mountains grow closer. The town of Smithers has the last bike shop for a long while so I pick up some more tubes. 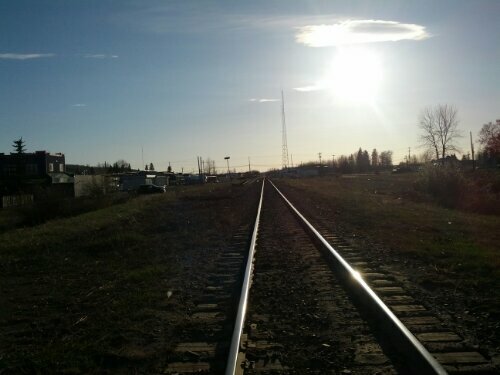 Smithers has a pretty nice downtown area and we stop for a late lunch and decide to stick around for the night. Three beers later and we head out in search of a motel. Not a block later we get stopped by two girls handing out cookies. It turns out one of them, Lillian, had done a tour in the past. She offered us a place to stay for the night and we took her up on the offer. Twelve miles out of town and a big hill later we arrive at the farm at which she’s staying. A good night’s sleep and an excellent breakfast later we backtrack the twelve miles to Smithers and continue west. Stopping in a tiny town for lunch, the only cafe in town is no longer a cafe. It’s an office of some sort but they just haven’t bothered to take down the sign or even erase the menu on the chalkboard. This is a bit of a recurring theme up here – places will often have a large “open” sign out front only to be shuttered permanently. And the restaurants and motels that are in fact open more often than not have a “for sale” sign prominently displayed. It’s all rather strange. 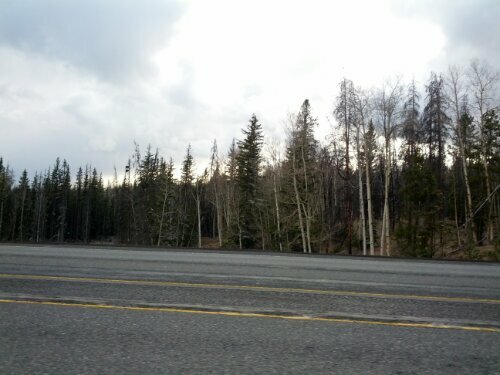 The scenery continues to be amazing and before long we reach the town of New Hazelton. We head off tomorrow into bear country and onto the Stewart-Cassiar highway, which will eventually link us up with the Alaska highway. There are very few towns for the next several hundred miles so I’ll be checking in when I can. Leaving Hope was a double entendre. Heavy rain came down and just a few minutes in we were drenched as we headed north into Fraser Canyon and the hills began. What would have ordinarily been a scenic view was obscured by the rain and mist. A couple hours of suffering later and the rain gave way to sunshine. For the rest of the day a strong tailwind pushed us towards the town of Lytton for the night. The restaurant in town served us half-frozen spring rolls. The small towns we stay in overnight are now spaced 60-75 miles apart, usually with one even smaller town somewhere in between. Food choices range between pubs, cafes, and the occasional Chinese food which at first breaks up the monotony before becoming part of it. Leaving Lytton we were treated by beautiful weather and views. Another stiff tailwind kept us moving quickly through the mountains, following a river. Before too long I got my first flat – a piece of metal managed to pierce my rear tire going down a hill. I made quick work of the fix and we continued on to eat lunch in a bar on the side of the road. Another couple hours in the saddle and we arrived at Cache Creek, a tiny town at the junction of route 1 which we had been following and route 97 which would take us north. The couple next door in the motel talked loudly past 3am. The next morning was frigid and once on the road we were greeted by a headwind. Progress was slow as the headwind turned into a never-ending hill climb which gave way to more wind and even snow as we approached the mountain pass. A quick lunch in the town of Clinton and the headwinds and snow continued as we pushed towards 100 Mile House for the night. The motels seem to be getting seedier somehow. The bagels I picked up a few days ago are positively mediocre so every morning I force myself to eat some in order to get them over with. 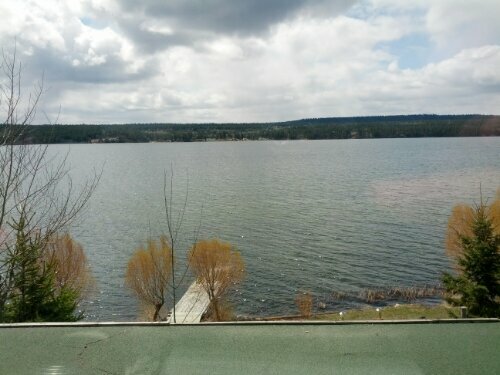 After another such meal we head out towards Williams Lake. There’s some more snow and I do my best to zone out of the freezing weather and just focus on making progress. The days are starting to blur together. 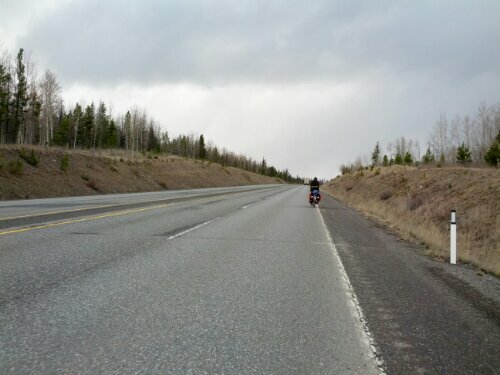 The road from Williams Lake to Quesnell has a nice tailwind so we make good time, but leaving Quesnell there is heavy rain that makes the morning full of suffering but it manages to clear up in the afternoon and another tailwind brings us to Prince George. 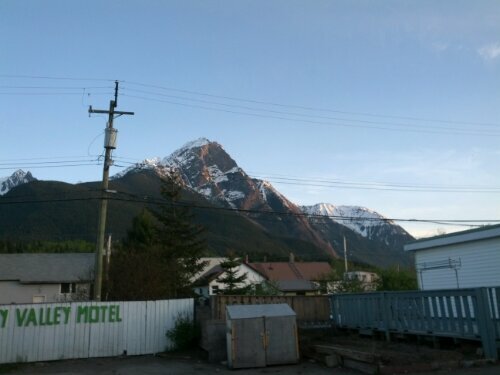 This is the last large town before Whitehorse, a thousand miles away so we’re spending a rest day here to visit a bike shop, do some laundry, and relax. As always seems to be the case with these sorts of things, we got a late start on the first day. Grabbing the ferry to Bainbridge, Donald and I wound our way up the Olympic peninsula before having a meal in port Townsend and ending the short day in Fort Casey state park on Whidbey island. The almost-full moon looked like headlights on my tent walls. 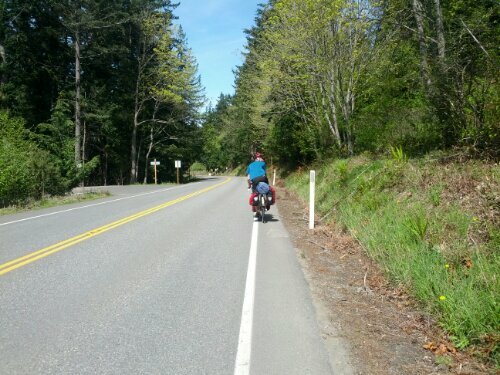 Wednesday morning was sunny and warm so we relaxed for a couple hours in the park before departing along the hilly route up Whidbey. A combination of bike problems, frequent and extended breaks, and a late start led us to only make it forty miles to Bay View state park. We did make it to camp in time top perform some much needed bicycle maintenance so we were ready for a long day on Thursday. Thursday came and despite a late start, we made quick work of the 25 miles to Bellingham, our last large city for a while. Stopping in REI for supplies, Donald had his bike looked at because he was still having some shifting issues. It was a good thing too, because he had some major problems, most importantly a broken derailer hanger. Additionally, his bike uses a rather rare kind of hanger and they didn’t have a replacement in stock. We found another bike shop in town, Earl’s Bike Shop who saved the day by having the spare part in stock and graciously making time to fix up Donald’s bike. By that time it was already almost evening so we had to call it a night in Bellingham. Friday brought tailwinds. The thirty miles from Bellingham to the border was gone in under two hours, the border crossing was smooth, and the roads were flat. 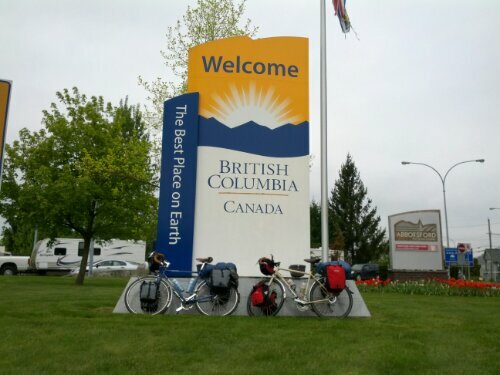 After a quick stop in Chilliwack we hopped on the Trans-Canada highway for the last thirty miles to the town of Hope. The three restaurants near our hotel were either closed permanently or for the day so we headed over to a subway for dinner. We’ve had a number of setbacks but have started making better time. With two people it’s hard to get started at a decent hour in the morning, the breaks are twice as frequent and frequently longer, and the pace is reduced to the lowest common denominator. But it’s still the beginning. Heading out of Hope now, into the rain. See you in four hundred miles, from Prince George. 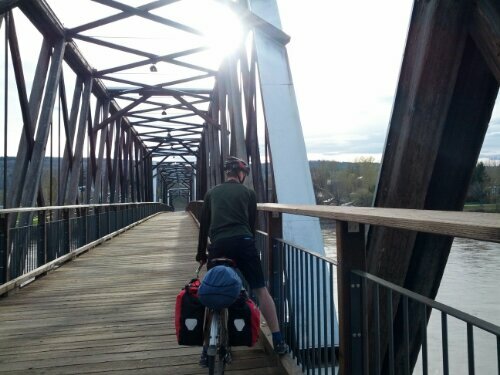 Next week I’ll be departing on my second extended bike tour from Seattle to Talkeetna, Alaska. I’ll be riding with my longtime friend Donald and we’re planning on covering the 2500 mile distance in about six weeks. Cell coverage in northern Canada is hard to come by so I will be posting updates on roughly a weekly basis, when I have wifi access. The bike trip is the first part of a larger adventure for me. Upon reaching Alaska I’ll be joining an expedition to climb Denali, the tallest mountain in North America. I’ve already shipped my mountaineering equipment to Alaska and all I have to do now is reach Talkeetna by June 4th when my mountaineering expedition is set to begin.